The first business meeting for February was held February 5, 2018 at the Great Valley Middle School in Room 154, 255 N. Phoenixville Pike, in Malvern, PA.
Frank A. Piliero, Chairman, Charles A. Philips, Vice Chairman, Michael J. Rodgers, and Hugh D. Willig. Kevin R. Kuhn was absent. Mark P. Thompson, Esq., Edward Theurkauf, Bob Dettore, and Daniel Wright, P.E. Linda Csete, Manager, Jim Thompson, Public Works, Tim Hubbard, Property and Public Safety Coordinator, and Lisa Gardner, Recording Secretary. Mr. Philips offered Congratulations to the Philadelphia Eagles for winning Super Bowl LII. Schuylkill Township has signs posted in Charlestown Township regarding an EAC Roadside Cleanup that need to be relocated to that township. Mr. Philips attended the Phoenixville Regional Multimodal Transportation Plan Meeting (regarding trails and road improvements) and stated that three of the priorities involved Charlestown Township. The Devault Rails-to-Trails project, the intersection of Charlestown Road and Hollow Road, and the narrow bridge on Route 29. The official list of approximately 13 projects will be published in May. Mrs. Csete announced that the 2017 Annual Report is now available, and the Winter Newsletter has been published and was sent to all property owners. Mr. Philips moved to approve the minutes for the January 2, 2018 Reorganization Meeting and Mr. Rodgers seconded. Mr. Piliero called for discussion and there being none, called the vote. All were in favor. Mr. Rodgers moved to approve the minutes for the January 2, 2018 Business Meeting and Mr. Philips seconded. Mr. Piliero called for discussion and there being none, called the vote. All were in favor. Mr. Philips moved to approve the January 2018 Treasurer’s Report and Mr. Rodgers seconded. Mr. Piliero called for discussion and there being none, called the vote. All were in favor. Mr. Philips moved to approve the General Fund Accounts Payable Report for February 5, 2018 and Mr. Rodgers seconded. Mr. Piliero called for discussion and there being none, called the vote. All were in favor. Mr. Rodgers moved to approve the Open Space Fund Accounts Payable Report for February 5, 2018 and Mr. Philips seconded. Mr. Piliero called for discussion and there being none, called the vote. All were in favor. Mr. Philips moved to approve the Liquid Fuels Fund Accounts Payable Report for February 5, 2018 and Mr. Rodgers seconded. Mr. Piliero called for discussion and there being none, called the vote. All were in favor. Mr. Rodgers moved to accept the January 2018 reports #1-13 as submitted and Mr. Philips seconded. Mr. Piliero called for discussion, and there being none, called the vote. All were in favor. Troop 78 Eagle Scout candidate A.J. Stacy presented his idea for a project along the walking trail, after the bridge, at Charlestown Park. His schematic showed the project, 58 feet up the path, where he will place an information sign, bench and perform a repair of the observation platform at the natural wetland area. Mr. Dettore proposed that the bench be installed at this location to enhance these improvements. Mr. Theurkauf provided specs for the trail of compacted red shale with Belgium block edging, to complement the current Park design elements. The Supervisors thanked A.J. and asked him to take pictures for the newsletter. Mr. Willig moved to approve the proposal from Recreation Resource USA for $1,836.25 for a bench to be placed in the observation deck area of the trail at Charlestown Park, with one additional bench to be held in reserve for future use. Mr. Philips seconded. Mr. Piliero called for discussion and there being none, called the vote. All were in favor. Mr. Thompson asked if there were any questions from those present. No one came forward. Mr. Thompson closed the hearing. Mr. Philips moved to adopt Ordinance #208-18 Amending Chapter 27 of the Charlestown Township Code by amending the Historical Resources Map, and Mr. Rodgers seconded. Mr. Piliero called for discussion, and there being none, called the vote. All were in favor. besides pouring a few sidewalks this project is in winter shutdown. there is about 3 days of work there, waiting for better conditions. this project is about 65% complete. The coordination of the mounting for signage is currently happening, while a fixture delivery is due around the 14th of this month. Signage may be up by the end of March. Mr. Dettore reminded Supervisors that the feasibility report will arrive the end of February. There are many options for the Board to consider, including a private-public partnership arrangement that he outlined in his letter dated 2/2/18 to Mrs. Csete. there are some wood decking in need of repair and signage to be installed, then it will be finished. Mr. Dettore has also been working with Eagle Scout candidates as they plan their projects. The project, although only a trail, required a NPDES permit. It is a big property with five separate drainage areas. The project was near a high-quality stream. This made a stormwater management plan a necessity. There were long processes for PennDOT and conservation district approvals. The hayfield became somewhat difficult to work due to the socks. He obtained approval from the County to relocate the socks nearer the hedgerow since construction is ending. Near the hedgerow, the socks will be less visually obtrusive and will still perform as intended and become “grow” socks. The conservation district likes the plan as does the DEP. The paperwork just needs to catch up with the verbal approvals. In Mr. Wright’s drawing, the red showed where the socks were going, the blue showed where they are at present. There will be additional cost for the contractor to move them, however, it is still much cheaper for the Township to follow this plan, than it would have been to install and maintain five basins. Mrs. Csete explained that there were two vacancies on the Historical and Architectural Review Board, one for a registered realtor and the other for a member of the Planning Commission. Ms. Thompson and Mr. Richter volunteered to fill the unexpired terms. Mr. Philips moved to appoint Planning Commissioner Mr. Michael Richter to a term expiring 12/31/2021 and realtor Ms. Cindy Thompson to a term ending 12/31/22 to the Historical and Architectural Review Board. Mr. Rodgers seconded. Mr. Piliero called for discussion and there being none, called the vote. All were in favor. HARB Co-Chair Mrs. Rosemary Philips provided background on an application by Richard and Laurie Salitas for 4128 Howell Road. The applicants seek approval for demolition of a one-story mid-20th century summer kitchen addition to the earlier 19th century stone farmhouse. A draft Certificate of Appropriateness has been prepared for the Board’s consideration. Mr. Philips moved to approve the Certificate of Appropriateness for 4128 Howell Road and Mr. Rodgers seconded. Mr. Piliero called for discussion, and there being none, called the vote. All were in favor. Mr. Eric Davison was not in attendance therefore this item was tabled. Mr. Daniel Sechrist, Mr. Joseph Craft, and Mr. David Schnackenberg, were in attendance to acquire approval for the Preliminary/Final Land Development Plan for Allan Myers, LP. It proposes to replace the scale house and office trailer with newer facilities on the Quarry property at 4042 State Road. Mr. Wright stated that the usual Land Development items are not an issue with this project. The unique aspect of the application, the existing operations, including the methods for dealing with stormwater management, and erosion and sedimentation control, are addressed by the proper execution of an existing Mine Permit issued by the DEP. The applicant will add dimensions for the proposed parking spaces to the plan. The dimensions for the employee parking spaces at the proposed Quarry Office shall be added to the plan. Mr. Wright mentioned that Mr. Kuhn thought this was an opportunity to get an update on the blasting. Mr. Joseph Craft stated that the focus is in a different area of the quarry now, but they expect to be in the quarry itself for about 15-17 more years. There is clean fill going into the hole to return it to how it looked before (as required by the DEP). Blasting is announced by their Call System. Although they used to blast 4 or 5 times more than they do now, now they blast about once every three weeks. Each neighbor bordering the quarry gets a phone call. Mr. Philips moved to approve the Preliminary/Final Land Development Plan for Allan Myers, L.P. with these waivers and Mr. Rodgers seconded. Mr. Piliero called for discussion, and there being none, called the vote. All were in favor. 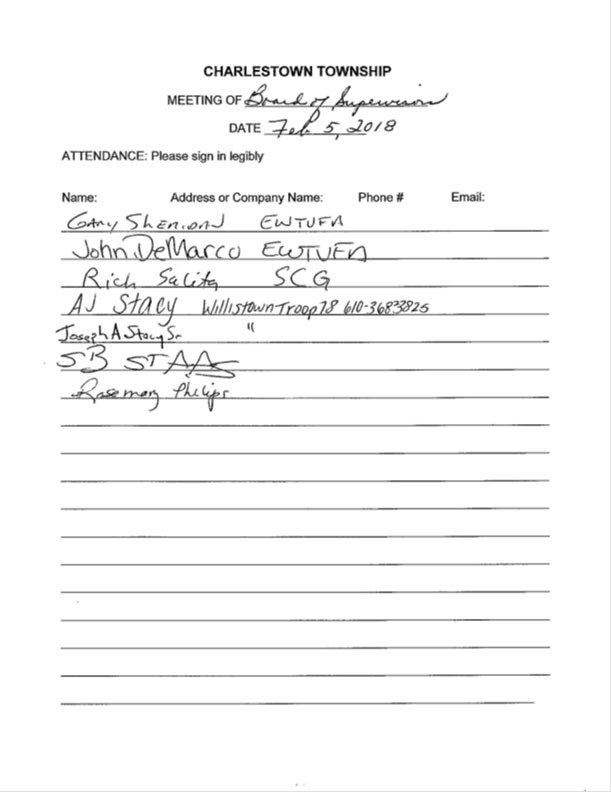 Mrs. Csete stated that the current contract with Melchiorre Construction ends March 31, 2018 and that she circulated a draft bid document to the Board for the April 1, 2018 - March 31, 2019 period. Roadmaster Jim Thompson reviewed the schedule of equipment and number of hours for each and made some adjustments from previous years. Mrs. Csete also stated that the current contracts with Charlestown Landscaping for mowing, and Davey Tree for tree work, end March 31, 2018. She met with Tim Hubbard and Supervisor Kuhn on January 8th to go over the details of the mowing and tree contracts. The previous contracts were for three-year periods. It was determined this time to make the mowing/tree contract for a one-year period but provide for up to (2) one-year extensions with language provided by the Solicitor. Mr. Philips moved to authorize advertising of all three Invitations to Bid for bid opening on March 5, 2018 and Mr. Rodgers seconded. Mr. Piliero called for discussion, and there being none, called the vote. All were in favor. Mrs. Csete said that once again she plans to organize an Earth Day Clean up event in April, and suggested April 14th. This is about a week earlier than usual, which is possible because the Easter holiday falls early this year on April 1st. An earlier date for the event allows for a contingency rain date of April 21st, before too much spring growth interferes with the clean-up efforts. Mrs. Csete said she and Mrs. Bird continued to go through old file boxes and identified 3 boxes of general files that were no longer of administrative value. Mr. Rodgers moved to adopt Resolution #908-18 authorizing the disposition of these records, and Mr. Philips seconded. Mr. Piliero called for discussion and there being none, called the vote. All were in favor. Mr. Philips has a meeting tomorrow with the Devault Village at Spring Oak group. The Supervisors still agree, they want to know what units are going where. If there are any changes they need to come to the Board; this gives a vehicle to the developer to show the Board what they want to do. Mr. Piliero adjourned the meeting at 7:55 p.m. The next meeting is scheduled for Monday, March 5, 2018, 7:00 p.m. at the Great Valley Middle School, in Room 154, 255 N. Phoenixville Pike, in Malvern, PA 19355.